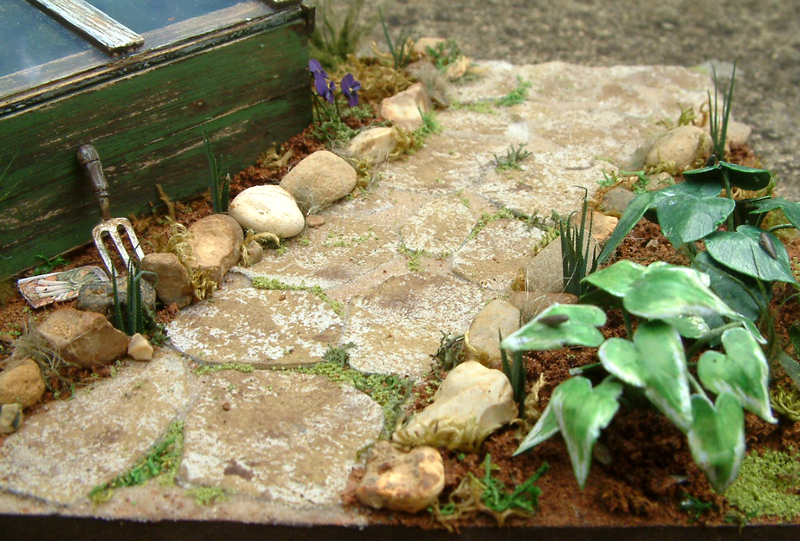 Nostalgia In Miniature Workshops: Featured In Dolls House & Miniatures Scene Magazine! Featured In Dolls House & Miniatures Scene Magazine! 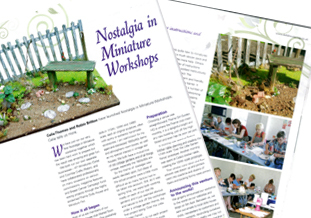 If you take a look at the brand new issue of Dolls House & Miniatures Scene magazine (Oct No 208) that has just come out in the shops, you will find on pages 34 and 35 a feature on our very first workshop in June and how this whole "Nostalgia In Miniature Workshops" initiative was conceived. If you came to our workshop in June, there are some photos we took on the day so you may see yourself in the magazine! Also, you will see at the end of the article that if you sign up to Dolls House & Miniatures Scene Magazine email newsletter before September 14th, you have the opportunity to win a free space on our October 23rd half day workshop - Over The Little Garden Fence Workshop - which is our first June workshop repeated all over again. 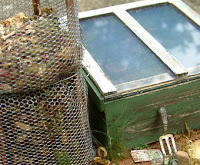 Weathered old cold frame, old fashioned crazy paved path, compost bin, slug eaten hostas, pansies, old garden fork, old seed packet plus various foliage as seen above, are what we will be creating at our September workshop. Meanwhile, just to say that we only have 5 more spaces available for our Down The Little Garden Path Workshop that is taking place on the afternoon of September 18th. If you would like to book a place please do get in touch with either Robin or Celia asap. It is advisable to either email or ring one of us first to confirm availability then a reserve can be placed whilst deposit/booking form is being sent. Our full contact details can be found under Contact Us on our workshop website.